The Composite Application Library helps architects and developers create composite Windows Presentation Foundation (WPF) applications. Composite WPF applications are composed of discrete, functionally complete, pieces that work together to create a single, integrated user interface. The Composite Application Library accelerates the development of composite applications using proven design patterns to help you build these types of applications. Build clients composed of independent, yet cooperating, modules. Separate the concerns of module builders from the concerns of the shell developer; by doing this, business units can concentrate on developing domain-specific modules instead of the WPF architecture. Use an architectural framework to produce a consistent and high quality integrated application. 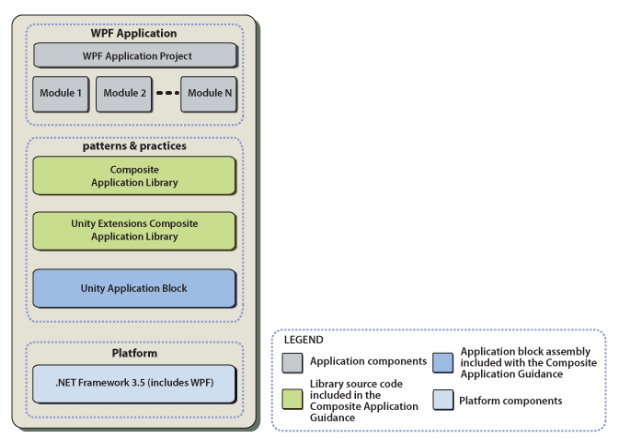 Your composite WPF application will use the Composite Application Library, and it may use the Unity Extensions for Composite Application Library and the Unity Application Block. These are built on the .NET Framework 3.5, as illustrated in Figure 1. Goals and Benefits. This topic describes the goals and benefits of the Composite Application Library. Technical Concepts. This topic introduces technical concepts used in the Composite Application Library and provides references to detailed information about several of the concepts. Development Activities. This topic describes how you can use the Composite Application Library to perform development activities that are common to many WPF applications. Customizing the Composite Application Library. This topic describes how you can extend the Composite Application Library.